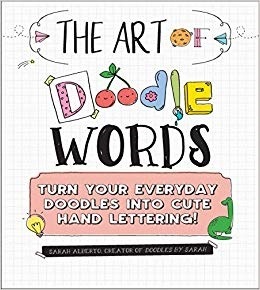 “The art of Doodle Words” is an inventive, amusing look into a playful art style: Sarah Alberto’s “doodle words” are hand-lettered art pieces which incorporate fun pictorial imagery into the construction of a hand-lettered word or phrase. For example, the word “tools” can be spelled out with different types of tools, or a line of cursive may be incorporated into a larger drawing. The introduction walks the reader through the basics of creating doodle art (including some suggestions for brain-storming and laying out a specific design), while the first part of the book gives numerous examples of different letter form styles: basic handwriting, a few script examples, bubble letters, block letters, and several other styles to give lots of variety and options to the imaginative artist. Different letter styles are offered side-by-side with numerous examples of phrases rendered in that style. Part Two of “The art of Doodle Words” contains numerous examples of fully doodled words, each example broken down in a step-by-step process so that the artist can follow along and practice creating them. Many of the examples would make good signage for parties or invitations, and fuel the imagination for more. Creative children may enjoy this book especially, as doodle words can work with any skill level and level of creativity; it could also add playfulness to any journaling or scrap-booking practice. This isn’t a book that teaches fancy hand-lettering or calligraphy, but if you’re drawn to learn Alberto’s playful style of typography, you’ll doubtless find many uses for this technique, and have a lot of fun learning and experimenting along the way. “The art of Doodle Words” doesn’t teach anything besides this very specific style, but the style is one that has an infinite capacity for variety and experimentation — certainly a great tool for any hand-lettering or crafting enthusiast!